Lieutenant Charles Okes was buried in the catacombs of St Georges’ Chapel on the 12th May 1860. On the 17th September of that year, his brother Richard, Provost of King’s College Cambridge, wrote to Chapter requesting permission to erect a small brass to Charles. The brass was erected in the Rutland Chantry Chapel in August 1861. But who was Charles Okes? Charles Okes was born in 1787, the 10th of 20 children of Thomas Verney Okes, a surgeon in extensive practice at Cambridge. He entered the Navy in 1800 as a 1st Class volunteer in HMS Prince George, a 98 gun second rate ship. From 1803 to 1806 he acted as a Midshipman in the Mediterranean and West Indies on HMS Seahorse, a 38 gun fifth rate ship, but missed the Battle of Trafalgar as the Seahorse did not take part in the action. In 1807 he passed for Lieutenant. During the remainder of his career in the Navy he was engaged in only minor actions on board HMS Indefatigable, a 64 gun third rate ship, where he was in charge of one of the gunboats at the defence of Cadiz against the French, and he ended his time aboard HMS San Domingo, a 78 gun third rate ship. He left the service at the age of 27, going to live with various family members until in 1830 he was appointed to the Naval Knights of Windsor, declining the rank of Commander in order to be eligible for the position. The Naval Knights formed the naval equivalent of the Poor or Military Knights of Windsor who had existed since the founding of the College of St George in 1348. The Naval Knights were established under the will of Samuel Travers, MP for New Windsor, in 1728, to be “superannuated or disabled lieutenants of English men-of-war”, single, with no children, inclined to lead a virtuous, studious and devout life, who could be removed if they gave occasion for scandal. In return for this, they would be provided with accommodation and an annuity. Due to legal wrangling, the first Naval Knights were not appointed until 1795, and in around 1803 Travers College, now occupied by St George’s School, was completed for their housing. Of the seven men appointed a Naval Knight, one would be elected as Governor, who would keep the common seal and ensure that the Knights behaved in accordance with the rules, attending daily service and wearing appropriate uniform, consisting initially of a knee-length embroidered blue coat with white facings and with white breeches. Charles Okes was appointed Governor in 1846, a post he held until his death in 1860. In the advertisement for a new Naval Knight to replace him, which appeared in The Times of 9 May 1860, Okes was described as “universally esteemed by his brother knights”. The same cannot be said for later Naval Knights. By the 1870s it was becoming general knowledge that the ideal of devout men living in common was not working and the records reveal many instances of fighting, drunkenness and profane language among the Knights and their countless complaints, reprimands and disagreements. The rules enforcing bachelorhood [even widowers were excluded until 1867] and church attendance were becoming increasingly unpopular, eventually leading to the formal request in 1874 that attendance at Chapel be voluntary. Despite relaxations to the rules, by the end of the 19th century the institution was in total disrepute. The last Knight was appointed in 1887, and in 1892 the Naval Knights of Windsor were formally disbanded. Even the end was undignified, with the last Knights refusing to leave and having to be forcibly evicted from Travers College. 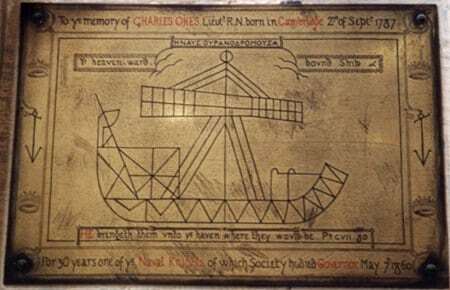 The brass with its quotation from Psalm 107 shows “Ye heavenward bound ship” surrounded by a border of ropes, anchors and crowns, a fitting memorial to a man of the sea.